THE people responsible for installing a million dollar elevator at a guest house of the Office of the Prime Minister without due authorisation face arrest and might very well be forced to pay back government funds illegally used to pay for the project. According to a strong worded statement released by State House late on Friday these actions were unauthorized, un-procedural and illegal and seeks to tarnish the commitment of the Namibian President to practice austerity and effective governance. According to the statement senior management in the Presidency has uncovered the illegal installation of an elevator at the Guest House of the Office of the Prime Minister in Eros, Windhoek. The installation was carried out without due authorization and respect for procurement procedures and as a result Dr, Hage Geingob mandated management in the Presidency, acting in close collaboration with the Secretary to Cabinet, Dr. George Simataa and the Executive Director in the Office of the Prime Minister, to do everything possible to identify the culprits and lay charges in accordance with applicable laws of the Republic of Namibia. The scheme was uncovered after it came to light that certain officials had illegally authorized the installation of the elevator at a cost of approximately N$999 000. No official decision had been made to install any elevator at the Guest House. Shockingly, the installation follows the parliamentary statement by the Minister in the Presidency, Martin Andjaba, in which he informed the National Assembly that former Vice President Dr. Nickey Iyambo was temporarily hosted at the Guest House of the Office of the Prime Minister. In light of the commitment of President Geingob to cut down wastage of public resources, the Minister in the Presidency, when previously asked by the media with regard to installation of the elevator at the Guest House said: “There are no plans, and there will never be plans to do upgrades at the house”. The Statehous statement said that irrespective of the underlying reasons and motivations of these individuals, their actions are clearly illegal as they were not authorized, nor did they follow the laid down mandatory procedures of procurement, which serve as checks and balances to prevent illegal, unauthorized expenditure. 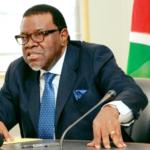 President Geingob has directed a full-scale investigation, to be constituted by the Secretary to Cabinet, assisted by officials in the Presidency.